A post on my inspiration for Landfall and Harbour Light. Two paintings currently in my portfolio and available from Number Four Gallery St Abbs. I’m interested in exploring, and this includes both our inner and outer worlds. As a psychotherapist in my other work, I spend my time with people helping them explore their inner lives. And for myself this has been a continual process of discovery. I have always loved the sea and travel, as I explore the outer world. My love of the sea is such that it has even taken me beneath the surface. For two or three years I was a keen scuba diver exploring the underwater landscape with as much enthusiasm as I explore above. Art and painting feels like it is another form of this exploration. One in which I am bringing together these two types of exploration, both inner and outer. In my work I am often inspired by the places I have seen, their history and how I have experienced them. This post is a reflection on the experiences of travelling and coming back to the familiar from the new. There are two paintings in my current work that were named in connection with these experiences of travel and exploration. Landfall and Harbour Light both have shapes and colours in them that remind me of being out at sea and approaching land from a distance. They remind me of being on a boat, standing on deck and seeing land approach. Distantly at first, the first shadows and shapes emerging slowly, then with more and more definition. During daylight as cliffs, buildings and fields become visible. Or in the evening, when the harbour lights are shining out. My fantasy is that the lights winking in the distance guide boats in as they return home. That might have been the case 100 years ago these days I expect that technology plays a much larger part in bringing ships home. Harbour Light. Mixed media on panel. 8×8 ” framed. There is also a metaphor in the naming of these works. The sense of an exploration of colour and shape and the resolution of that exploration as forms are discovered in the process of painting. A form that resonates and brings a settling in the artist. As something emerges in the process of laying down paint and marks that brings sense of familiarity or meaning to something that can be a chaotic process, without a clear direction or intention. So for me, that was when the ideas about harbours, land and sea became apparent in these paintings. When I begin a new painting it is like setting out on a journey and one where I do not know the direction of travel. To go forward I must be willing to suspend my need for knowing as I explore and find my way. the work becomes about responding in the moment to what is happening rather than planning or thinking about an end goal. How do you approach your work? What are the challenges you face in following your creative process. How do we name art work? Sometimes I find it is an easy process, sometimes I find myself digging deep to find the words to express what the piece means to me or what I want to say about it. Early in my journey as an artist I would name the work by location or what the image was. For examples Trees in Winter, which was one of my earlier semi-abstract pieces. Then there was the series of paintings I completed that were inspired by the Isles of Scilly. These works used the place name. So there were pieces like Boat at Tresco, View From Innisgden. More recently I’ve been following suggestions to think about creating a story in the name of the work itself. This can often take some time to work out. And it’s not unknown for me to do internet searches for songs, poetry and, even in a pinch, an abstract art title generator. All in the hunt for words and phrases that will spark something in me that resonates with the piece. How I now name my work falls into three categories. Firstly, the title will be because the piece reminds me of something in the landscape and I want to reference that in the title. An example of that is Digging Deep from the one of my posts. Secondly, it might be because the words of a song or a piece of poetry have seemed fitting in some way. They become a description of the emotion that is stirred in me when I look at the painting. Finally the title describes very process of making the work. What I experienced and felt in the creating of the painting. Do I have a favourite method? Probably not. They all feel appropriate at the time. And I hope that in their own way they convey something to the viewer of the experience of the work for me. Here’s a few examples from my portfolio and a little on the naming process. Drown the Fleeting Hour is a piece inspired by poetry and the emotion of the piece. How we can be drawn in to something. In this case a painting, and lose ourselves and time in ways that we don’t notice until afterwards. Landfall describes the feeling of being out at sea, metaphorically and literally. What we see as the coastline approaches and the feeling of coming home to something familiar. The sense of coming back to land from travelling, to finding familiarity after journeying in the unknown. Direction of Travel. Currently available from Number Four Gallery St Abbs. A reference to the making of the work. This piece was a larger work at 27×29 inches. With it’s larger shapes and use of space in the design was the direction I wanted my art to be progressing. Hence, Direction of Travel. So, a few more thoughts from me on artistic and creative processes. How do you name your work? Do you find it an easy process? What resources do you use to help you? Please drop a comment below, as I’d love to hear from you. My next Facebook live is on Monday 18th February at 7pm UK time. I’ll be showing and talking about my inspiration for some of the new work that will be exhibited during March. Plus I will have four paintings from my work last year that I’m offering as part of my Etsy Shop Sale. Maybe “its all about value” is something of an exaggeration. However there is some truth in the fact that value, the relative light and darkness of a composition is key in making impactful and successful work. I had an interesting experience and some very useful learning on this subject in the last couple of days or so. If you read my blog you will know I did a 12 week online course at the beginning of last year with Nicholas Wilton . The course had a huge impact on my painting. Nick talks a lot about how important value is to design. In fact the first few weeks of the course are spent looking at this. And he stresses that it is one of the first areas to consider in evaluating work. Recently I had nearly completed a couple of paintings and had posted them for feedback in a group I am part of. I received some very helpful comments that were mainly about value. That in both of the paintings the suggestions were to review values and look to increase the differences in the light and dark. I found myself feeling really resistant to making changes. Afterwards I understood that it was because I had an idea in mind I wanted to pursue and I was unwilling to let go of it. It took a chat to a friend and fellow artist who has lot of experience in design to bottom out my resistance. Our conversation was all about how sometimes, no matter how much you may want to include something in a piece of art or design, you may just have to let it go and move on. So my moving on process involved printing of a value scale. I realised that had not been checking values in my work often enough. Lesson number 352 in remembering to so this on a regular basis from now on. I looked at the piece again and really considered the values in it. As I did this I realised that I had, without really considering it, made a painting that was quite dark, as the differences in value were negligible. If you look at the two images above you can see what I mean. Looking at the version in grey scale, then it is mostly a work in the 5 – 10 range. It doesn’t stimulate the eye with contrast and difference. Because the grey is a dark grey the black shapes do not stand out as much as they would if the grey was much lighter. What about the learning points? I have a habit of painting dark and I need to keep a value scale to hand to help me with this for while. I’ve gotten into the habit of not checking often enough. Do not fall in love too soon (again) Click to see my other post on this. And be prepared to give up something. Or maybe find a way to scratch that creative itch in another way. Feeling resistant? Don’t ignore it. Explore it and see what this might be about as there is probably some useful learning to be had from your resistance. What tools do you find most helpful in your work? Have you had a similar experience? How did you resolve it? Are you thinking that you might be interested in building your confidence as an artist? In my experience confidence is often based on how we account what we are good at, how much our self-limiting beliefs and critical inner dialogue affects us, how we prioritise ourselves and our work, and how effective we are at getting the feedback we need to support ourselves. Building on my recent post about Supporting your Artist Mindset, with these things in mind I have devised a six week challenge with a question or task each week for you to consider, think and journal about and which you might find helpful in building more confidence. There is plenty of time between each email for the task and to reflect on the changes you are making. I will be posting a series of questions or tasks each week for the next six weeks, taking a week off at Christmas. If you are interested, and to make sure you don’t miss a post, then sign up to my newsletter list here to ensure it comes directly to your inbox. The first email will come out after you sign up for the challenge. And do let me know how you get on, I love to hear about people’s progress, learning and success. Have fun and happy painting. Sign up for the 6 week email confidence boosting challenge. This post is about some discoveries about capacity and connectedness that emerged from a recent period of struggling to paint. I’ve been having a tough few weeks. My art; often a refuge, delight and source of energy has not been going well. I have been feeling frustrated, irritable, comparing my work to others and feeling self critical. As a therapist and coach I recognise this as being in a defensive pattern because I am feeling vulnerable. I am feeling vulnerable because there is a lot going on in my life at the moment, both good and not so great. Across all areas of my work I have been very busy. We have had really successful start to the year in my psychotherapy training business (TA Training Organisation). In my art a new gallery, Number Four Gallery in St Abbs, have taken eight pieces of work for their Christmas Show. I have been accepted to join Peak District Artisans. I exhibited at the local Artist and Designer Fair in Buxton. However, in the midst of these positive events, there have also been some difficult things happening that are affecting me emotionally and psychologically. So I have retreated from myself and others in a protective way that is an old unhelpful pattern. Which brings me to the point of this post and the learning I’ve gained from this experience. So, what is the learning I’m wanting to share? Firstly about connection. If we are making authentic art this is an expression of part of self. Then it seems to follow if we are not fully connected to ourselves we will be disconnected from our art. As I think back over the last couple of months this is what I have been experiencing. In my art making, in the studio in front of the painting, I was going outwards to what others were doing and looking to repeat what I had already done, rather than looking inwards at what I felt inspired to do. My choice of colour, mark making and ways of painting were not what I truly felt in the moment because being disconnected from myself meant I was disconnected from what I felt. How important it is then to our art making to stay connected to ourselves and the personal choices we want to make. Secondly scaling up and scaling down. During this period the only thing that felt “like me” were some colour studies I was working on. Using an exercise from Louise Fletcher fellow artist, (see Louise in This Painting Life on Facebook) I had about 15 different small colour studies I was playing with. What I was noticing was that the bigger works (a couple of 20×20 inch paintings) were not resolving themselves. Again, on reflection, I can see that it was almost as though I didn’t have the capacity to do anything bigger. That not only does making bigger work require us to scale up in terms of the tools, materials and composition, it also requires us up to scale up in terms of our process as well. Being able to hold and contain the experience of something bigger takes capacity. For larger work to be successful it needs to feel integrated as a whole rather than something that is almost a collection of smaller works on a bigger canvas. So in the process of making larger works the artist needs to have creative energetic capacity to conceptualise the whole. Which is not about planning the outcome but more about having mental space and energy for the art-making process. Are there any useful “how to’s” from this experience? Well for me a recognition that I have a busy life and so there will be times when I don’t have capacity for major works. When that happens it’s ok, and that art making can still happen, just on smaller scale. The “how to” from this is acceptance of personal limitations. Does this tally with your experience of moving between larger and smaller works? I’d love to hear how you maintain your connectedness? All colour studies will be available to buy at my next exhibition in Buxton at the Pavilion Gardens on Friday 23rd, Saturday 24th adn Sunday 25th of November. How to support your artist mindset. Belief in Ourselves, or Believing Ourselves. Do you have belief in yourself? Or, do you believe yourself when you are repeating some unhelpful or critical inner dialogue? This post is one of a number I will be writing over the next few weeks on how to support your artist mindset. I’m a member of a few art groups on social media. I have been noticing quite a few conversations about how people experience themselves in making their art. People post about their successes and also their struggles. Often the struggles seem to be about mindset. What I mean by this is anxiety about the work, what people might think, fear of success, risk taking or being seen are just a few examples of how our personal psychology can interfere with the process of art making with ease. As a qualified psychotherapist in my other work I’ve long thought how important personal psychology is in making satisfying and authentic art. Part of the training to be a therapist means years of personal therapy. As a result I think I know myself pretty well these days, and I have been able to work through a lot of my insecurity, self limiting beliefs and confidence issues over the years. When I first started painting I was struck, and I continue to be struck, by how important the psychological process of art making is in making authentic work. I think because the experience of art making is deeply personal and revealing of self the experience of art-making intensifies and heightens our psychology in ways that other types of activity doesn’t. Believing Ourselves: The Unhelpful Mindset and How to Work With It. Fear and anxiety: Fear and anxiety are such common experiences for people. In our evolution they were responses to danger and to keep us safe. In modern living we often have this response to more everyday activities. One of the common patterns of thinking and feeling in anxiety states is to overestimate the “danger” or impact of the things we are feeling anxious about and to underestimate our capacity to cope with it. Therefore some simple reality testing is a very helpful way of reducing anxiety. By reality testing I quite literally mean checking the basis – the evidence – for the fears and anxieties we hold. This is a cognitive approach where engaging our thinking in a positive and self supporting way can assist in assessing the action or activity we are anxious or nervous about. Taking regular time to relax and de-stress is also very important as this will make us generally less susceptible to an anxious response. Comparing to others: When we compare ourselves others we can diminish ourselves . Finding something in another person’s work we like or are inspired by is very different to making ourselves not ok in some way because we think we are not as good as the other. It’s useful to check in with ourselves when we are making comparisons. To ask ourselves the question – am I inspired or am I making myself less. Unrealistic expectations: having unrealistic expectations or seeking perfection are ways that we can be not support ourselves. The trouble with unrealistic expectations or perfectionism is that we can set the goal so high that we never actually begin. Or we get so lost in the process of trying to be perfect that we lose contact with the overall aim of what we originally set out to do. Sometimes good enough is the thing to focus on. Critical inner dialogue: listening to the critical inner voice. Our inner critic can be loud sometimes. Whilst sometimes well-intentioned (See my post for more on this) our inner critic may hold us back . Working out an effective strategy to deal with your internal critic is another useful positive artist mindset approach. Self limiting beliefs: beginning a process of recognising what beliefs you hold that are unhelpful is an important step in self awareness. Knowing your learning edges and how to work with the aspects of your psychology that have the potential to hold you back is another aspect to consider. Self limiting beliefs can be across a whole range of areas. Here are some examples I have come across in my therapy and coaching work. It’s not ok to be a success, to think for oneself , to have feelings, to be important, to be creative, to belong, to be seen. These beliefs can hinder us in many unseen and unexpected ways. Once we know they are there we can be more active on our own behalf in ensuring they do not derail us from our goals and set about changing and updating them to positive attributions. Belief in Ourselves: Self Supporting Mindset. A self supporting mindset is as much about knowing ourselves, our edges and limits and how to work with them as it is about changing aspects of self. Confidence: Confidence helps us to risk, experiment and play. Whether this in the making of our art, in the selling and promoting of our art. Developing ways of building confidence is hugely important. An immediate and simple suggestion is to keep a journal, or record in a way which suits you, of every success so that you begin to account your achievements. This is one way of supporting your confidence, and when you feel uncertain read it to boost your confidence remind yourself of the positive evidence of success. Self knowledge: knowing ourselves, our learning edges, strengths and how to self support. Self knowledge helps us to recognise what might be difficult. What are the things that might hold us back. Once we have this knowledge we can take action on our own behalf and make arrangements, maybe support or resources to help us get what we want. Vulnerability: being willing to be vulnerable with ourselves and others. We are more likely to have support if we can be open and honest about what we need, where our learning edges are and the things we need help with. Responsiveness: paying attention to ourselves and what we need to support ourselves. Then taking action, being responsive to ourselves by problem solving. Potency: being potent on our own behalf. Different to power which can be misused potency may mean doing things with energy and vigour. Being effective and resourceful. It might also mean keeping agreements and commitments with ourselves and others. Holding our integrity. These are some of the ideas I’ve found helpful in my own personal development and that I use in coaching. What have you found helpful in supporting your artist mindset? Interested in learning more about my coaching? Contact me to arrange for a free 20 minute chemistry check. Or want to meet me to chat about these ideas? My next exhibition is at the Octagon Centre, Pavilion Gardens, Buxton, on Saturday and Sunday 20th and 21st October. Contact me to book a chemistry check. Icefloe. mixed media. 12×12″. Board,. Framed. This post is to introduce my new Colour, Collage and Texture Workshop which i am excited to be running next year. This workshop is all about painting abstractly and using colour, collage and texture in the work to create impact. It is a follow on session to my introductory session into Abstract Painting. For people who have attended that day this new workshop builds on the material learnt in that session. 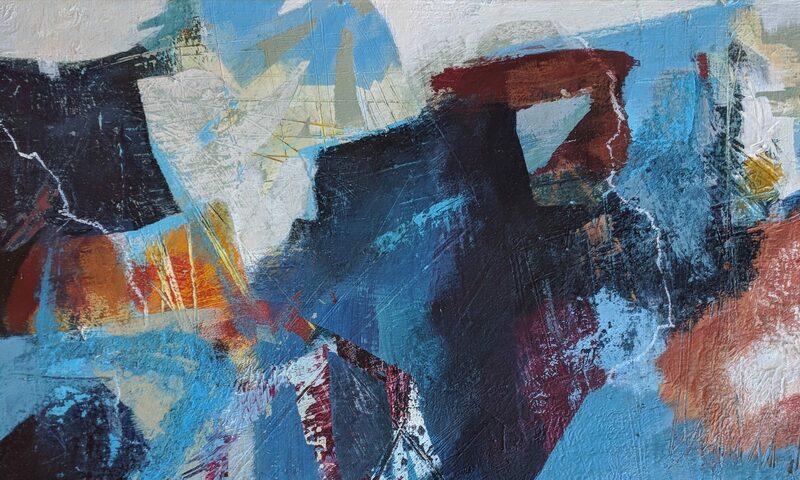 If you are already painting abstractly then this session can help you bring further refinement to your work and develop the impact of what you are painting. The focus of the day is two fold. To demonstrate and teach a range of techniques using texture and collage that can be incorporated into abstract work. To look at some of the main ideas in colour theory and then to think about how to use those ideas to create more impact in your work. Specifically, we will take a look at how to use colour through value as well as ideas about colour harmony and working with complementary colour. I will go over the principles of the colour wheel and some basics in colour theory. We will spend some time on colour mixing exercises to help you understand the various properties of colour and how to use it effectively in your work. We will also look at a range of techniques to build texture into your work along with how to make your own collage papers. The day is at the Old House Studio outside Glossop in a beautiful location overlooking the Pennine Way. There is a well equipped purpose-built studio with space for up to eight people. I have been teaching adults for over 20 years in various capacities. My teaching style is relaxed and informal and I teach from a place of facilitating you to find your own style of working. I will demonstrate the techniques and work on my own painting during the session so that you can observe my application of the ideas taught. There is also lots of time for one to one input and coaching during the day. If this sounds like something that might be of interest then book your place by using the form below or book here. I’m going to keep this pretty simple, I thought I would write a short post of my top 5 reasons why coaching can be useful and beneficial. Art coaching can support us so we don’t feel alone or isolated, struggling without help. Even when the work is going well sometimes we can feel this way. A reality of artistic life is that artists can often spend large amounts of time on their own. Plus a common pattern for many people in general is not to ask for help. So, having regular time where support is focused on your goals and aspirations can be really useful in making progress. And, as we are supported we are no longer on our own. Part of how I see the role of an art coach is to provide objective feedback . Sometimes we need someone who is not connected to us in the way that friends, colleagues or family may be, to give us feedback. Art coaching can offer feedback. That can be on patterns and behaviours we are doing. It can also be on things we are not doing. Of course this may not always be entirely comfortable, and it can be very useful to have our habits, perceptions and areas of development highlighted. What is key about this kind of art coaching feedback is that it is given with empathy and support and in the service of supporting the artist being coached, in meeting their goals. Sometimes we might not have all the information, experience or there may be gaps in our skill set. This might be information around techniques, use of materials, artistic or creative processes. It might be about aspects of business. How to make use of social media for example, the best way to approach an art gallery. Or it might be about psychology – why we feel dissatisfied with our work, struggling to find our voice or anxious about what others might think of our work. Another person who has travelled the path before us may have information that is useful to us, Art coaching can point us in the direction of resources we were not aware of. An artistic coach may have knowledge and skills we can draw on. Or be able to help us recognise where self-limiting beliefs are hampering our success. An art coach can support to help us see our strengths and discover our learning edges. Too often we can be self critical which is not useful in evaluating work and deciding what to do next (see my post on the inner critic). Having someone alongside us to help with critique rather than criticism can help in the process of learning, exploring and finding our voice. Coaching has an element of expertise about psychological goal setting and how to achieve our aims. Having access to theory about human nature can help us understand ourselves better, have a more effective relationship with ourselves so get what we need for ourselves. My approach to art coaching is based in Transactional Analysis. I have been working with people in the field of personal development for over 15 years. Sessions can be online or at my office in Buxton. Interested in finding out more? Book in for a free 20 minute chemistry chat. A chance to find out about each other and whether we might work together. I love books and I’ve quite a few art books on my shelves. Some are almost encyclopaedias of techniques with different media. Others more inspirational – examples of other artist’s work I use when I want to think about new ways of developing my own style of painting. My collection reflects my development as an artist, so I have books on impressionistic oil painting, landscape painting, working with acrylics, watercolours and finally developing abstract work. Here’s mixture of some of my favourites. The Search Press Guide to Painting Techniques: a detailed book of techniques across a wide range of different media. Search press produce a good range of books that cover different techniques. Compendium of Acrylic Painting Techniques: a rich source of ways and means of creating with acrylics is also excellent, particularly if you are new to acrylics and interested in learning more about all the many and varied ways you can use the paint. Betty Edwards – a great writer and really helpful when it comes to understanding how to draw. Her book Drawing on the Right Side of the Brain is excellent. She offers a very clear and effective process for representational drawing. She’s also written a book on colour techniques as well that is full of great exercises and ideas to help you understand about tone and hue. Experimental Landscapes in Watercolour by Anne Blockley. Anne is a watercolourist and her book is full of glorious images of her work along with lots of suggestions and ideas for how to use watercolour. Her use of colour gorgeous. Acrylic Colour Explorations by Chris Cozen. This is a book of Chris’ work along with some of her students. Another lovely compendium of inspiring images that I’ve very much enjoyed leafing through. And finally, Creating Abstract Art is a book by Dean Nimmer. Emeritus Professor, Dean Nimmer, is the former Chair of the Painting, Printmaking programs at Mass College of Art, where he taught from 1970 to 2004. This book looks at the nature of intuitive painting is is a rich source of exercises and ideas for loosening up and getting in contact with our intuitive artist. Do you have a favourite art book? I’d love to hear your suggestion if so. Interested in learning to paint with me? My new workshop programme for next year is now available here.